Enter to win a NOR Goodie Package! Ends 6/14/2013. People say scent is the sense of memory but I find that taste evokes far more vivid images. Like my Mango Bride character Beverly Obejas, I would as a child, peel ripe mangoes as though they were bananas and eat them down to the bone. Doing that now reminds me of lazy summer afternoons at my Auntie Dea’s home in Iloilo, when the air was nearly as sticky-humid as the mango juice that dripped from my chin and elbows. Even the mundane meals of childhood evoke vivid memories. My mother disliked cooking, but our family -- like other middle class families in Manila -- employed a live-in cook hired on the basis of her prowess in the kitchen. Growing up with a series of servants offered us a spread of food from all corners of the country, for each new cook prepared dishes common to the province from which she came. Esther, from Bicol often madelaing, a spicy mix of taro leaves, pork and shrimp stewed in coconut milk. For Sunday dinner, Nita from Ilocos sometimes prepared Igado a labor-intensive concoction of diced pork tenderloin, liver and kidneys sautéed in garlic and onions. And every cook had her own nuanced version of that quintessentially Filipino dish, chicken and pork adobo. The holidays called for a bounty of special dishes. My father had eight siblings, all of whom produced multiple children, so I was raised in the company of 40 cousins (and that was only on the my dad’s side). Christmas clan reunions were potluck events, with each family bringing their specialty to the buffet table. It was like Thanksgiving, but with presents. My family usually brought Arroz Caldo a simple dish that reminded my father and his siblings of growing up during World War II war. In those difficult years, their widowed mother would stretch out one chicken to feed her nine hungry children by cooking it with ginger and garlic to make a flavorful broth. The broth was then used to boil a pot of rice while she shredded the chicken, before stirring it back into the glutinous rice. Many Christmases later, I would sit in the kitchen helping our cook prepare Arroz Caldo. Scalding my fingers on just cooked chicken, I’d nibble on choice morsels whenever Nita the cook wasn’t looking. Those were more prosperous times, so Nita would add a can of cream of mushroom soup to enrich what was essentially a Filipino risotto. At the Christmas Eve party itself, I would ignore the Arroz Caldo because there were so many other delectable treats demanding space on my plate. The star attraction of the long buffet table was lechon, a whole spit-roasted pig. Only its torso was carved up, its crackling-crisp, mahogany-colored squares of skin and lemongrass-scented flesh piled high on a plate between the intact head and haunches, tail curling high above the splayed hind legs. Further along down the line were shrimp dumplings arranged like so many little purses on a silver tray; thumb-long batons of fried pork spring rolls, and pansit palabok, the rice noodles drenched in a saffron-hued annatto-shrimp gravy and sprinkled with chopped spring onions, oysters and crumbled pork cracklings. Holiday desserts took up another table. Golden ovals of leche flan glazed with caramel syrup sat next to a bowl of chilled fruit salad made with heavy cream and canned fruit cocktail. Chewy Food for the God squares jostled for space beside the platter of bite-sized rice cakes flavored with coconut and purple yam. The inevitable brick of Christmas fruitcake and a wedge of thin-sliced queso de bola (aged Gouda cheese) rounded out the spread. I’ve long forgotten the Christmas presents, but the memory of those holiday feasts is so clear that my mouth waters even as I write about them today. When I moved America, meals perforce became much simpler for lack of time and the absence of servants. Nevertheless, when homesickness hits in late December, I usually spend an afternoon rolling out shrimp and pork dumplings for pansit molo soup. These take exponentially more time to make than microwaveable mac & cheese, but the resulting dish is well worth the extra effort. At least for as long as it takes to simmer the broth, my home smells just like the one I knew and loved, growing up in Manila. Banished by her wealthy Filipino family in Manila, Amparo Guerrero travels to Oakland, California, to forge a new life. Although her mother labels her life in exile a diminished one, Amparo believes her struggles are a small price to pay for freedom. Marivi Soliven has taught writing workshops at UC San Diego and at the University of the Philippines. Her writing first gained recognition with silver medals for children's fiction at Palanca Awards for Literature in 1992 and 1993. In 1998 her short story "Beaux Café" won the Philippines Free Press Grand Prize for fiction. Another short story, "Talunang Manok," was adapted for a short film in December 2011. Short stories and essays from Soliven's 15 books have appeared in anthologies and textbooks on creative writing. Her essays and stories have been featured in Where Are You From? An Anthology of Asian American Writing and The Journal of Post Colonial Studies. She gained entry to Hedgebrook's Writers in Residence program in 2012. Under The Mango Bride's original title, In the Service of Secrets, the unpublished novel won the 2011 Carlos Palanca Memorial Awards for Literature, the Philippine counterpart of the Pulitzer Prize. In January 2013 Ediciones Planeta Madrid bought the rights publish The Mango Bride in Spanish. 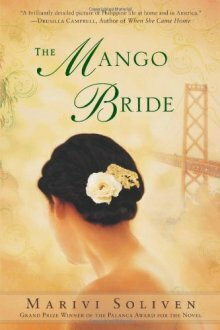 The Mango Bride will be issued by Penguin Books on April 30, 2013.